Presse en Allemagne par Record Service GmbH, Alsdorf" with barcode. Barely legible, after the word "laws," is "Printed in France." 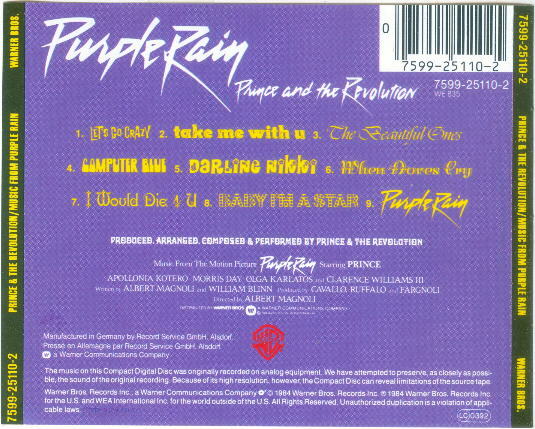 Only known back cover for this disc. This "half-target" version was also issued in Europe. There are at least two pressings. the disc face and has the catalog number 925 110.
successor to the French target. See the separate listing. This is another, even later version of the "half-target" also issued in Europe. This one says "Made in Germany" at 6 0'clock and has tiny perimeter print in English, German and French. The catalog number is now 7599-25110-2. The matrix info is "759925110-2 WME" plus lots of various rectangles. A large "7" is embossed backwards in the plastic center on the obverse, and a tiny "IFPI 080C"
is embossed on the reverse. My guess is this was issued circa 1994-1996. This is the rear tray card for the above half-target. It reflects the new catalog number, and adds the French price code "WE 835". "Manufactured in Germany by Record Service GmbH, Alsdorf. Pressé en Allemagne par Record Service GmbH, Alsdorf." "Printed in France" near the bottom. The LC "bullet" obscures the old catalog number. 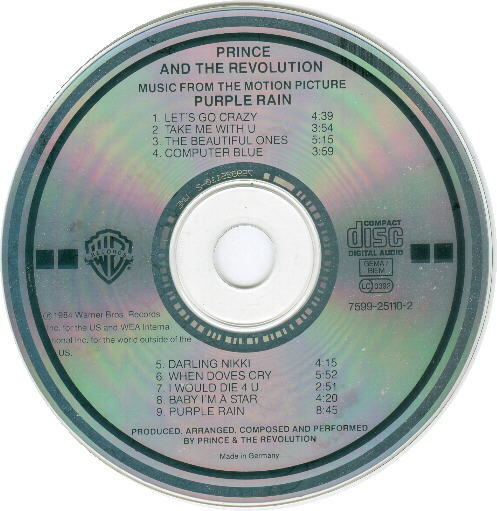 Notes: This disc (German target CD) is very hard to find, even in Europe. Apparently, it had a small press run, before being superceded by the half-target version. The half-target versions are very common, and may be still available at retail.